Dani Ligett (center) with sister Gaby (l) and friend Jane (r) at the 2008 Norris Cotton Cancer Center fundraiser last July. _Dani Ligett and I were introduced through our cancer center's volunteer program. The first time we met, she was lying in a hospital bed with a 24-hour-old tram-flap reconstruction. Within 10 minutes I'd yanked my shirt off to show her what the final product might look like. We've been friends ever since. Dani, an elementary school guidance counselor, was one of the first women to have MammoSite treatment at Norris Cotton Cancer Center, northern New England's largest cancer facility. Four years ago this Christmas, I went for my usual mammogram. The next day, I was standing in front of a class of fourth graders, and the classroom phone rang. It was Margie [the director of our cancer center's breast program]. And I knew right away. I hung up the phone and went back to teaching. I went in the next day with my friend Carla for another mammogram. The radiologist came in and said, "You have a calcium deposit pattern that strongly suggests cancer. We need to do a biopsy to confirm it." She left the room, and I said to Carla, "She just told me I have cancer, didn't she? "I'm in cancer mode, aren't I?" _Dani had a bilateral biopsy "the worst 3 hours of the entire cancer experience" and the pathology confirmed it: DCIS. But a lumpectomy performed just before Christmas brought other, more ominous results: IDC. Invasive cancer. After surgeon Kim Grafton did a sentinel node biopsy thankfully negative Dani met with her oncologist. She was estrogen- and progesterone-negative; HER2-neu-positive. But back then, Herceptin wasn't widely prescribed; it was considered dangerous. And with no nodes involved, she was considered "right on the line" for chemo. I pushed really hard from the beginning for MammoSite. The radiation oncologist told me, "Protocols haven't been approved for using MammoSite for IDC." It made so much sense to me to keep the radiation site-specific that I continued to push. In the middle of our planning, the radiologist went to the annual San Antonio Breast Cancer Symposium in Texas, where good outcomes were being reported for IDC patients getting brachytherapy (MammoSite). As a result, she agreed to let me give it a go, as long as I understood that the long-term studies to prove positive results just weren't there yet. 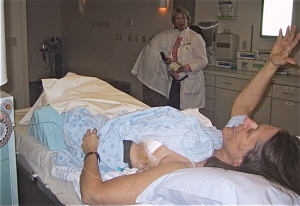 MammoSite involves inserting a catheter with a balloon at the end into the breast, positioning it so that the balloon can be inflated to fill the hole left by the excised tumor. The balloon is inserted on Friday; the incision heals over the weekend, and treatment begins the following Monday.But there's a window of opportunity for MammoSite treatment; it must be delivered within 2-3 weeks of surgery, before the place where the tumor was removed heals and fills in. So Dani, already 2 weeks post-surgery, was racing against the clock when she traveled to Dartmouth-Hitchcock Medical Center, site of our local cancer center, on a Friday morning in mid-January. 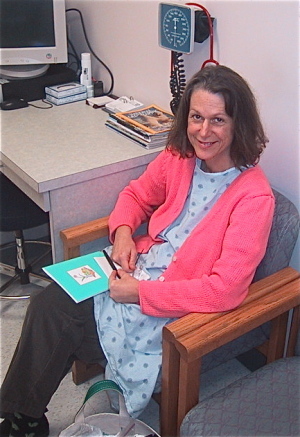 I was one of the first dozen or so women to have MammoSite done at Hitchcock. I just wanted the whole treatment process over as quickly as possible. I was going to be all done with cancer. I was pretty excited. Everyone, the radiologist, surgeon, staff, and medical students were squashed into a tiny procedure room, lots of joking and laughing. "We've never done this," someone said. The laughing gave way to X-rays, measuring, tense conversations, more measuring, calculators, looking at the X-rays. Finally, Kim said, "Dani, I'm really sorry. We can't do this." The hole had healed too far. "The only way is if I bring you back to the OR and I re-excise the area and place it that way." "OK, let's go." I said. But it wasn't that simple. There was no OR space available till the next week. So Dani's treatment was delayed another week, and it was now the third week in January. I went into the OR on Friday morning. They removed more tissue from the tumor site, creating space for the catheter. The tissue was sent to pathology, and came back negative, so I was really sure there was no cancer, which was nice. I went home with a tube sticking out of my breast, and spent the weekend thinking healing thoughts, imagining the tissue shrinking around the balloon a tight seal between my breast tissue and the balloon was necessary in order for the treatment to start. Monday, I went back for an MRI and X-rays to see if the balloon was situated right. I waited, and waited... Either I'd be on my way to the radiation suite, or back to the OR to have the catheter removed. Finally the whole team came in and said "YAY, we're starting radiation!" And we went right down to the radiation suite. Dani was introduced to the Mammosite machinery, invited to pick the music she'd like to hear during treatment, and made comfortable. Treatment was finally about to begin. After 45 minutes of the radiology team adjusting things and hooking me up to the "radiation robot" (my nickname for it), they closed that big, horrible door like a bank vault it was the first time I felt really alone. The catheter tube was draped over my arm, and I could feel the vibration of the radioactive seeds as they shot through the tubing into my breast. 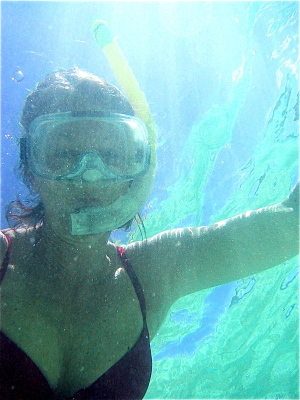 I could hear them rattling around like little maracas in my breast, but I couldn't feel them. Hooked up to "the robot." At the end of the irradiation which took less than 10 minutes the seeds rattled back into the robot. They checked me with a Geiger counter, put padding around the catheter, and said, "See you this afternoon." I'd planned to go to school between the morning and afternoon treatments, but that wasn't realistic. There was no getting comfortable. I was pretty much exhausted the whole time. I didn't go to work. A few days, I just stayed at the hospital; I didn't even want to drive home. The reality is that MammoSite week is MammoSite week, and that's all you do you take care of yourself and get your radiation treatments. Midweek, during a treatment, I started crying and crying. The whole experience caught up with me. The nurse, who keeps a close eye and ear on patients in the radiation suite asked, "Dani, are you all right?" "I'm just having a well-earned cry," I said. "I'm momentarily depressed because I have cancer. Could you just let me cry?" I couldn't stop crying. I'd been worried about keeping it light for my kids, keeping it light for my mom, being sure it was OK for school. I was alone in the dark. And it felt so good to cry. It was cathartic, in a very good way. And it was lovely that the team was that caring. They worried about everything that week. I finished on Friday. They took the catheter out; yanked it out like they yank out your breast drain after a mastectomy. A month later, IDC became part of the Mammosite protocol. I saw the radiation team for two post-treatment follow-ups. I haven't seen them since. I was glad to be done with the whole process, but I miss a team that was so helpful and caring. A year later, almost to the day, I was re-diagnosed with cancer at the same site. Kim [surgeon Kim Grafton] said, "This cancer is out to get you. We're doing a mastectomy. It's the only decision I can live with." Dani had a mastectomy and immediate tram-flap reconstruction. And that's when I met her. We've since talked about her MammoSite decision. Why did she choose this new therapy, over something so proven? What motivated me? Compressing the treatment time. I thought it would be less debilitating than the 5 to 6 weeks of daily radiation. But now I believe it was just as debilitating. I had chronic exhaustion for the better part of a year afterwards. Everyone can say it was from stress, the recovery from surgery... but I don't know of anyone who had radiation that doesn't think the radiation was debilitating. It's a lingering exhaustion that just goes on and on... But I can't pick it apart, what's from surgery, what's from stress, what's from radiation. Now, I have a radiation burn mark on my breast that'll be there forever, a scar from the catheter that'll be there forever. Did I have a recurrence because of MammoSite? Because I didn't do chemo? Because I didn't have a mastectomy when they thought I had DCIS? You know what? I had a recurrence. Period. And that's it. I don't think anyone did anything wrong. All you can do is put one foot in front of the other. Dani shakes her head, thinking back to 4 years ago, to her original diagnosis and decision to do MammoSite treatment. If I had to make the decisions all over again, I can't say I'd make the same decision. All of the information is different the choices are different. It's really amazing that in 3 years, it's that different. I'd say I think MammoSite might be good for people in rural areas. People who have to travel a long way. If it's no worse, then why not? But if it's no better why? Dani and I leave the inn, and walk out into the November dusk. Night is beginning to fall, but the air is mild. We take deep breaths, enjoying this last bit of warmth before the onset of winter. We put one foot in front of the other. Together, we continue the cancer journey.